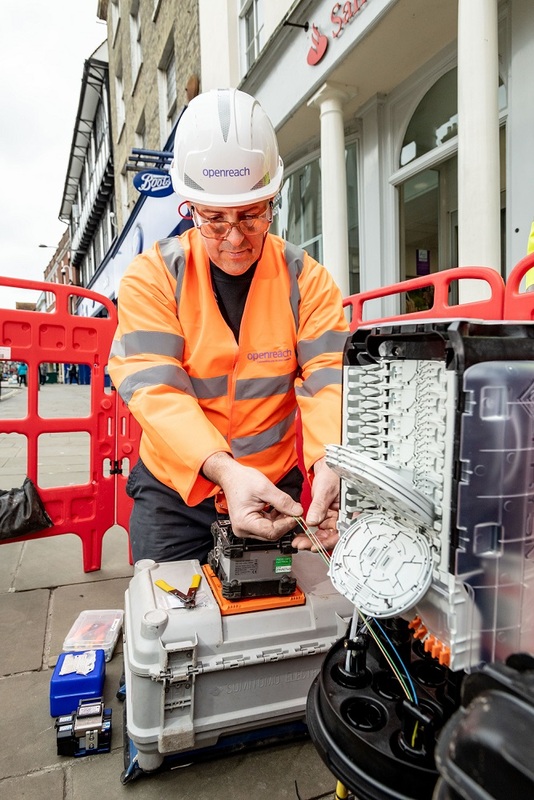 Good news for residents and businesses in Salisbury as in another 12 months there should be universal coverage of FTTP via the various providers that sell the Openreach FTTP service. The roll-out to more than 20,000 premises is the latest addition to the Fibre First programme and while there is some FTTP in Salisbury already this is not from the Fibre First programme and we look forward to finding the first new live areas. A number of other Fibre First areas are getting close to universal coverage but these are invariably just one exchange in a much bigger area, whereas Salisbury is ideal for a city wide deployment headline as it has just one telephone exchange. Following early discussions I had with Openreach last year, I am absolutely delighted by their decision to make Salisbury the first Openreach city in the UK to gain access to full fibre broadband. Full fibre will significantly improve the attractiveness of Salisbury for companies looking for a location with cutting-edge connectivity, boosting the number of high-quality job opportunities for constituents. With speeds of 1Gbps, I very much look forward to seeing how this investment will transform opportunities for local residents and businesses, as well as driving innovation in the provision of public services. We should qualify the statement from the local MP, Salisbury is the first for a city wide roll-out, since there is already a growing amount of Fibre First FTTP in a number of other cities across the UK. The build is already underway hence the photograph above, so fingers crossed we will shortly find the first live areas. On some Fibre First exchanges we have seen a roll-out that takes a long time with small amounts each week and on others there seems to be nothing even though we know they are building and then large swathes suddenly appear. We checked a couple of things ahead of publication for example whether those outlying areas such as Nunton and Obstock will be included and they will. Also there is some OFNL estates in Salisbury, due to the lock out that exists currently these will remain OFNL FTP infrastructure only. The growing speed with which we connect online with our families, friends and work colleagues, not only brings us closer together, but it also provides huge benefits for our economy. I’m delighted that Salisbury will be the first UK city to gain universal access to the gold-standard of the internet – ultrafast full fibre – making it one of the most cutting-edge cities in the country. It’s vital that every family and business across the country can benefit from this new technology, which is why we’ve committed to deliver a nationwide full fibre network by 2033. Salisbury is set to be first city in the Openreach network area but for the UK it is going to be a race between KCOM and Kingston Upon Hull for universal coveraage, plus you can add roll-outs from CityFibre in places like Peterborough and Aberdeen which in 12 months time are going to be potential contenders for universal access to FTTP. One problem that does seem to put some doubt into the mind of the public around ordering a full fibre service is the repeated use of the label 'ultrafast' which has many thinking they will need to order something like the 300 Mbps or 1000 Mbps products when FTTP appears, when in reality most providers have a mixture of superfast and ultrafast speeds with differing price points. In the situation where people already have a VDSL2 connection delivering superfast speeds this has the potential to stop some people upgrading from say a VDSL2 connection delivering 33 Mbps to one of the 55/10 or 80/20 FTTP services. Cos Chancellor of the Exchequer, Philip Hammond are the landlord in this area own some houses as he want FTTP there. See panorama last night. Disgraceful Wilson. When Openreach claim a premises is passed by FTTP how close do they get? Is it the nearest telegraph pole for overhead lines and perhaps the nearest chamber where the metal telephone cable runs underground? Michael. It is the DP, in urban areas this is normally the closest pole or underground chamber. But there can be a 2nd pole where the premises are further apart ( these will not have anything running up them just cables suspended as at present). In Rural areas it is more common to find 2 or more spans to reach from the DP. You can clearly see which have the fibre manifold on top and which don't.